The 21st Centuries' Fitness Guide! 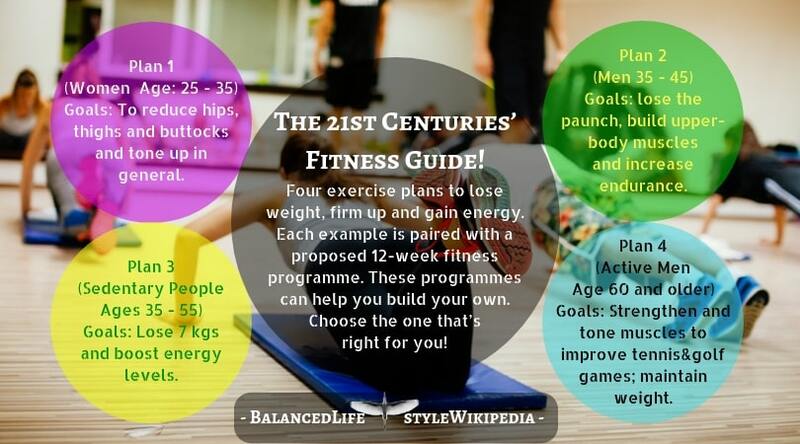 Health & Fitness The 21st Centuries’ Fitness Guide! Four Exercise Plans To Lose Weight, Firm Up And Gain Energy! The durability of the great fitness boom is credited largely to the common-sense appeal of a stronger heart and healthier body. But in fact, not everyone is sweating just for the health of it. A checklist of other motives would include weight loss, increased energy and bigger muscles. They add up to a body that is a source of both comfort and pride to its owner. A single-minded focus on health also ignores the range of shapes, sizes, abilities and temperaments that defines individuals. A fitness regimen your neighbour or colleague loves may leave you bored and barely advanced toward your own goals. All the weight training in the world will not take the kgs off, for example; 40 miles of running a week will not build muscles. To motivate dropouts, the 50 per cent who quit an exercise programme within six months, fitness experts are shifting away from programmes based solely on cardiovascular workouts. Rather, they are looking harder at individual aims and goals, and taking strength and flexibility more seriously. To be sure, aerobics is still central to a well-rounded fitness programme, but there is more emphasis now on being responsive to what people want to do and want to get out of it. To illustrate this new pragmatic approach, here are expert-designed programmes for Sarah, John, Susan, and Michael, four hypothetical persons who want to look and feel better as well as to strengthen their hearts. All are assumed to be free of medical conditions that would keep them from exercising. Your profile or goals may not duplicate those of our hypothetical examples. But the examples are peppered with useful details for anyone concerned with strength, flexibility, weight control, cardiovascular endurance and injury prevention. Each example is paired with a proposed 12-week fitness programme. These programmes can help you build your own. Many younger women would like their weight redistributed. Sarah is between 25 and 35 years old. She has lavished attention on her career to the detriment of her body, though she eats carefully. She is not overweight. But like millions of women, Sarah is not happy with the way her weight is distributed. Saddlebags, heavy hips and thighs and ample buttocks run in her family. She wants to take off as much of the localized excess as possible. In addition, she would like a generally toned-up, stronger body. Experts say Sarah must first accept that exercise cannot selectively burn fat from one area of the body. Despite the advice often touted in women’s magazines and heard from some aerobics gurus, floor calisthenics that isolate one body area, such as leg lifts for thighs and buttocks, simply do not trim fat from those areas, though they may feel as if they do because of the “burn” caused by muscle fatigue after such exercises. Sarah’s other problem is genes. Many women’s bodies are programmed to deposit fat in the hips, rear and thighs, while men are more likely to gain spare tires around waist. These fatty areas are hard to slim down, but it can be done. The best way is by losing weight slowly. A programme that emphasizes long, moderately paced aerobic workouts, is most effective at taking off pounds. Such workouts burn fat better than shorter, more intensive workouts because the longer an aerobic activity lasts, the more fat calories the body burns. In a 20-minute workout, for example, 80 per cent of the calories burned come from carbohydrates and less than 20 per cent from fat stored in cells. In contrast, in a 60-minute continuous workout, between 50 and 80 per cent of calories burned come from fat. Who: Women between ages 25 and 35 concerned about excess weight in specific areas. Goals: To reduce hips, thighs and buttocks and tone up in general. Recommendations: Long, moderately-paced aerobic workouts are best. Weight training will strengthen both upper and lower body. Three days: Walk 2 miles (3 km approx.) at comfortable speed. Stretch 10 minutes, following walk. Three days: Walk/jog 2 miles in 30 minutes. Stretch 5 minutes. Two days: Follow walk with 15 minutes upper-body strength training and abdominal curls. Two days: Walk 2 miles in 30 minutes. Two days: Strength training, upper and lower body, 20 minutes. One day: Ride stationary cycle, swim, any stroke, for 20 minutes. Two days: Walk/jog 3 miles in 40 minutes. Two days: Stretching and strength training, 25 minutes. One day: Stationary cycle at comfortable resistance, 30 minutes. Two days: Walk/jog 2 miles in 24 minutes, followed by stationary cycle, 10 minutes. One day: Low-impact aerobics class with stretching and floor exercises, 45 minutes. One day: Upper-body work with weights, 25-30 minutes. Two days: Walk/jog 2 miles in 24 minutes, followed by stationary cycle, 20 minutes. Two days: Swim, any stroke, 30 minutes. One day: Stretching and strength training, 30-35 minutes. Two days: Stretching and strength training, 30-35 minutes. Sarah is not overweight, however, so she should not overdo it. Forty minutes for a favourite aerobic activity, done at moderate intensity at least three times a week is a good compromise for her; a mix of aerobic activities, as outlined in Programme I, would even be better. This is because each exercise brings different muscles into play, helping improve overall body tone and fitness. Walking, riding a stationary bike or stair climbing on machines built for the purpose, all are exercises that can be done comfortably at moderate intensity for relatively long periods. Proportional loss: Sarah’s arithmetic is simple. If her eating habits don’t change, she will burn off 1,000 to 1,500 calories a week, translating into a loss of 3-7 kgs within four to six months. The weight will come off proportionately, meaning that Sarah will lose slightly more weight from her hips, thighs and buttocks because more fat is stored there. But her upper body, including her breast and face, may lose fat, too. In some women with shapes similar to Sarah’s, too much weight loss can produce a gaunt, even anorexic, look above the waist and can even be dangerous. To help prevent her upper body from withering and to meet her other goals, Sarah should strengthen her upper body by doing 20 minutes of exercises two to three times a week with barbell weights or on Nautilus-type weight-resistance machines. This will not prevent all aft loss above her waist, but it will help keep Sarah from looking emaciated if she does lose a full 7 kgs. As middle age approaches, many men yearn to fend off flab and bad backs. Approaching 40, John has hung on to a fairy good physique since his days as a college athlete. But commitments to job and family have left little time of late even for his beloved squash and tennis. The mirror is no longer a friend. A paunch is evident and growing, his shoulders have slumped and his chest and biceps have shrunk. He also has chronic lower-back pain. Enough is enough, he thinks. John wants his old body back or at least as much of it as he can get. His is a common dilemma. After age 20, both men and women lose about half a pound of muscle every year if they are inactive, as are most urban peoples. The muscle will be replaced by fat of weight stays the same. This is not an inevitable part of the aging process. It’s what happens if you don’t work the muscles. And it is easier to prevent along the way, through regular exercise and strength training, than to overcome after 10 to 20 years of sloth. Growing appreciation of this problem has spurred the American College of Sports Medicine (ACSM), a leading organization of sports doctors and fitness experts, to revise its widely-followed fitness guidelines. The new guidelines recommend that in addition to regular aerobic activity, every adult American do strength enhancing exercises at least a couple of times a week. Strength conditioning may include workouts with barbell weights or on the Nautilus or Universal-type machines found in most fitness clubs. But callisthenics that use the body’s own weight, such as push-ups, pull-ups and leg lifts can also fit the bill. The relative merits of these various activities are widely debated. Some experts feel that the newer nautilus-type machines are more comfortable, work individual muscles better and produce fewer injuries. Other feels that free weights demand more of the muscle being worked. Most serious weight-lifters use both, but say they get bigger muscles with free weights. Fitness experts advise novices to seek instructions on how to use both safely and effectively. One of the principal benefits of strength conditioning is that it may help maintain weight. Muscles are the body’s motors, burning most of the energy it produces; losing muscle but continuing to take in the same amount of energy in the form of food dooms you to add weight in the form of fat. Conversely, muscles that get built up and regularly exercised burn more calories and do so more efficiently than poorly conditioned muscles. Weak, inflexible muscles also tend to be tight. They are muscles that are more easily pulled and strained and that allow ligaments to be pulled or strained or joints to be dislodged, sometimes resulting in serious injury. For example, weak quadriceps (muscles in the thigh) are a common cause of the knee pain that plagues runners. Regular participation in such sports as squash, tennis golf, basketball and soccer, among others, demands conditioned muscles as well as conditioned heart and lungs. Who: Men ages 35 to 45 who want to gain strength and avoid lower-back problems. Goals: lose the paunch, build upper-body muscles and increase endurance. Recommendations: Combine weight workouts with aerobics activities that build upper-body strength, such as swimming. Three days: Walk 2 miles at comfortable speed. Two days: Walk/jog 2 miles in 30 minutes. 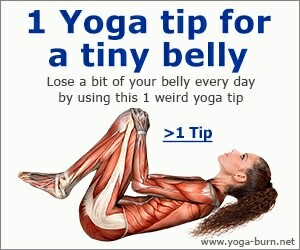 Two days: Stretch 15 minutes. One day: Swim 100-200 yards slowly, any stroke, resting if needed. One day: Walk 2 miles in 30 minutes. Two days: Swim ¼ mile at comfortable pace. Two days: Stretch 5-10 minutes, followed by upper body strength training, 20 minutes. One day: Swim ½ mile in 25 minutes. Two days: Stretch 5-10 minutes, followed by 20 minutes of weight training and 10 minutes of abdominal exercises. Two days: Swim ½ mile in 25 minutes. Two days: Stretch 5-10 minutes, followed by strength training, 30 minutes. One day: Abdominal exercises, 10 minutes. One day: Walk/jog 3 miles in 40 minutes. One day: Swim ¾ mile in 35 minutes. Same as week 7, but add 30 push-ups and 10 minutes of abdominal exercises to two days. John wants to add size to his muscles rather than just toning or strengthening them. Building muscles takes concerted effort, but consistent workouts of moderate intensity and length can produce visible results in as little as two months. Experts advise that John commit himself to aerobics and flexibility as well as to building muscle. Body building without doing aerobics and stretching is not a good idea. 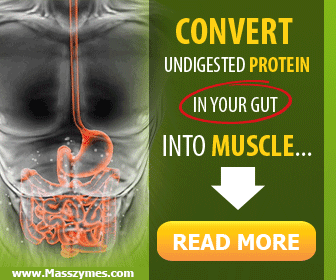 It produces large but tight and injury prone muscles that also lack endurance. Experts advise that John start off with a couple of weeks of stretching and aerobics alone to help work out the kinks and condition little-used muscles. Swimming is the best aerobic sport for John, since it concentrates muscle activity in his upper body. Swimming helps build strong and flexible shoulder, neck and back muscles, which may improve John’s tennis and squash games. When it comes time to lift the weights, john should use both barbells and machines and plan on three 30-minute sessions a week, preceded by stretching and warm-up aerobics or by his weekly aerobics or by his weekly aerobic exercise. For best results, John needs to do at least two and preferably three repetitions of each strength-training exercise, lifting the weight 10 to 15 times each exercise. He should use a weight for each exercise that he cannot lift more than 20 times. To help ease his lower-back pain and to tone stomach muscles, John should schedule 10 minutes of abdominal curls at least twice a week. Slowness and symmetry are two keys to effective, safe weight training. Rushing with weights invites injury, and slower, more deliberate movements yield better results. “Symmetry” alludes to the common mistake of building up only “cosmetic” muscles, those of the chest, biceps and shoulders. This creates imbalances that can lead to lack of flexibility and poor sports performance. The opposing muscle also needs to be worked, such as the hamstring at the quadriceps muscle in the front, and the arm’s triceps muscles as well as biceps. Now 45 or so, you’ve never been truly fit. Here is how to start from scratch. Susan, in her mid to late 40s, has spent her life working full-time and raising two children. She has never embarked on a formal exercise programme. A fondness for desserts has helped add 15 kgs to her frame since she was 35, and her energy level is not what it was. Susan wants most to drop the extra kgs and to gain her energy back. The experts advise a strategy that emphasizes gentle aerobic activity, as well as stretching to put limberness back into sluggish limbs. The main problem with people like this is that they become exercise dropouts if pushed too hard. Experts prescribe a month of a “pre-aerobic” programme, such as walking three times a week with a group of friends at a moderate pace for about 20 minutes, accompanied by 10 minutes of gentle stretching. Who: Sedentary people ages 35 to 55. Goals: Lose 7 kgs and boost energy levels. Recommendations: Get limbs moving in light aerobic exercise. Four days: Walk at comfortable pace 30 minutes, followed by 10 minutes of gentle stretching. Two days: Walk/jog 3 miles in 45 minutes. One day: Stationary cycle or swim, 20 minutes. Two days: Stretch, 10 minutes. Two days: Walk/jog 3 miles in 42 minutes. One day: Stationary cycle, 30 minutes, or swim 20 minutes. Two days: Stretch for 5-10 minutes, followed by exercises with light hand weights, 10 minutes. Two days: Walk/jog 4 miles in 60 minutes. One day: Stationary cycle, 30 minutes, or swim, 20 minutes. Two days: Stretch 5-10 minutes, followed by exercises with light hand weights, 10 minutes. In many ways, people like Susan have the most to gain from exercise. Studies show that those who have engaged in no exercise will show the most gain in the shortest period. After a month of pre-aerobics, Susan’s condition will have improved sufficiently that she will have to pick up the pace to meet her goal of losing 15 kgs, which might take an additional eight to twelve months. Her energy level should begin to increase within a few weeks, though some initial fatigue after starting an exercise programme from scratch is common. Susan should combine walking two or three days a week for 30 minutes, with one or two days a week of swimming or exercising on a stationary cycle for 30 minutes. Why settle for a senior slump? Plenty of older people are firm and fit. Michael in his mid-60s, worries about remaining active and healthy as he enters his senior years. He plays golf regularly and tennis occasionally and wants to continue to do both, and even get better on them. He also works around the house. He’s not overweight, but his muscle tone is not what it once was, and the skin has begun to sag on various parts of his body. Fitness experts have traditionally been cautious with senior like Michael, and for good reason. Frail bones and conditions like osteoarthritis, which afflicts 70 per cent of people over age 65 to varying degrees, make them far more prone to injury and mishap in rigorous or high-impact exercise programmes. In a study by the University of Florida, for example, 60 per cent of seniors who took up running after a three-month walking regimen suffered injuries that forced them to scale back to walking. Even so, many older people can participate in a wide range of physical activities, including weight lifting, without any problems. Like many older people, Michael’s goal are best met with a programme that keeps muscles strong and flexible and able to endure in the sports he wants to participate in. Swimming twice a week for at least 15 minutes will strengthen his shoulder and chest muscles for tennis and golf as well as give him a low-impact aerobic workout. Biking, outdoors, in good weather and indoors on a stationary cycle, is another increasingly popular low-impact activity that Michael should try, especially if a swimming pool isn’t handy. He should devote 15 minutes twice a week to stretching, taking care to proceed slowly, carefully and with special attention to his neck, lower back, and shoulders, all areas he could injure in his chosen sports. An additional 15 to 20 minutes twice a week spent on lifting and curling 3 to 7 kg hand weights 15-20 times, and then repeating the process two to three times, will help Michael strengthen his upper body, prevent injury and sustain his endurance. Who: Active men age 60 and older. Goals: Strengthen and tone muscles to improve tennis and golf games; maintain weight. Recommendations: Combine light aerobic activity with stretching and light weight training. Three days: Walk at comfortable pace 20 minutes. Two days: Stretch upper body, 10 minutes. Three days: Walk 2 miles in 35 minutes. Two days: Stretch, 15 minutes, followed by lifts and curls with 3-7 kg hand weights, 15 minutes. One day: Swim 15-20 minutes slowly, any stroke, resting if needed. Two day: Swim, any stroke, or ride exercise cycle, 20 minutes. One day: Walk 3 miles in 45 minutes. No exercise programme works magic. Unless you have hours a day to devote to the pursuit of physical perfection, the ultimate body will remain elusive. But a pleasing body that works as you want it to, and doesn’t break down as much, is well within almost anyone’s reach – and faster than might be supposed. You simply have to define your goals, make a schedule and feel properly guilty whenever you stray. Wow! I was looking for this information from the last six months. Now that’s what I call a laser-targeted article! Thanks for the great info!